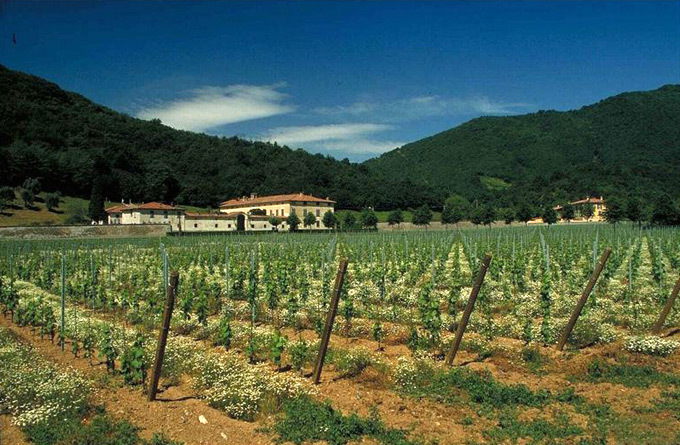 Park the car in front of the Strada del Franciacorta offices (Via Verdi, 53 - Erbusco) and turn right up the slope. At the stop sign go straight along Via Verdi, still going uphill. 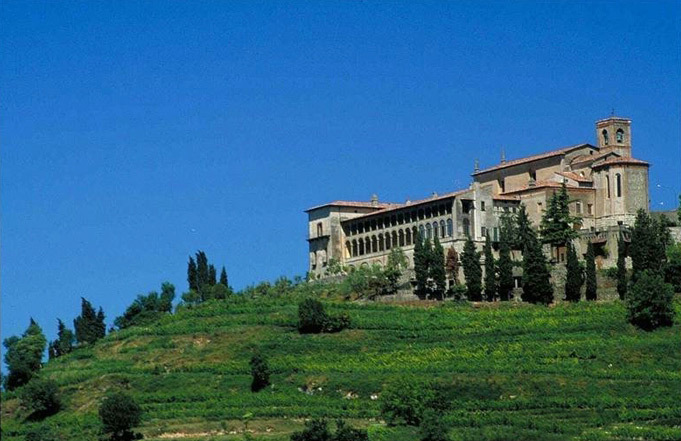 To your left you can admire the beautiful Villa Lechi and the Palazzo Longhi de Carli. Continuing downhill on Via Verdi, ride along a long wall, then turn right on Via Metelli, looking toward Monte Orfano and cross a residential area. The itinerary continues through Via Villa Nuova and Via San Giorgio. In the small centre of the hamlet Villa there is an isolated bell tower. At the roundabout, turn left onto Via Crocefissa, which lined with ancient tenements. At the junction, turn left uphill onto Via Pedergnano Sotto. 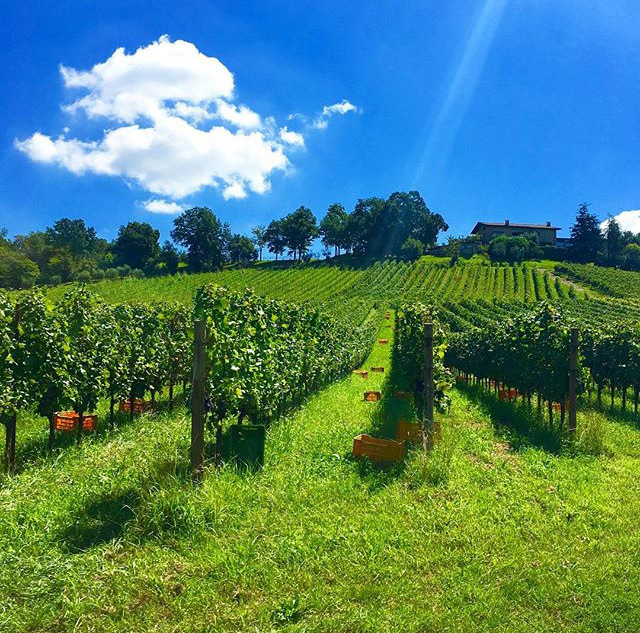 At the stop sign, continue on the same road, from which you can admire the vineyards and the view of the lower Franciacorta, then uphill again on Via Mattina. At the stop sign, turn right, going downhill, until you reach the provincial road to Iseo. Travel 1200 metres until the sign for Calino where, turning right, a slight effort will take you to Via Sala. 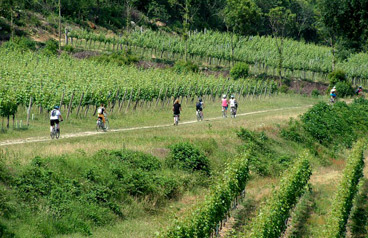 Here a road between vineyards leads you to the residential part of town. Turn right at the War Memorial on Via Paolo VI, following the signs for Bornato. At the roundabout, turn left on Via San Michele, going downhill. At the stop sign, turn left again and continue to the village of Bornato. 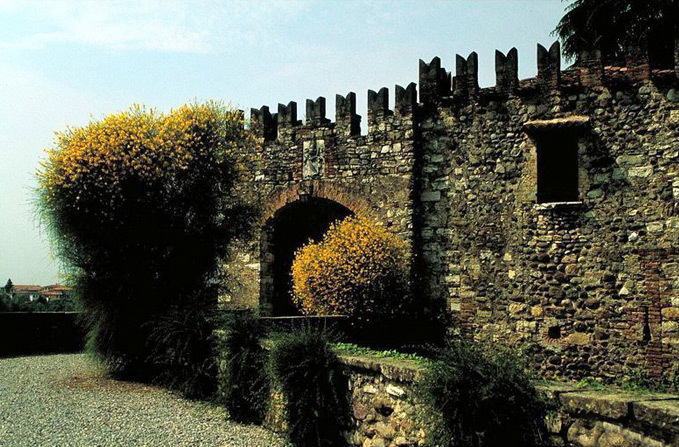 After crossing the level crossing, continue on Via Basso Castello and ascend a narrow sloping road that leads to Bornato Castle, surrounded by massive stone walls. A road to the right leads to the entrance, then turn left along a narrow cobbled street that goes downhill and is lined with ancient buildings and walls. At the end of the cobbles, turn left into a shady street. At the stop sign, turn right towards the level crossing and, after crossing it, take the long cycle track up to Barco di Cazzago. Along the way you can admire the church of Our Lady of Zucchella. 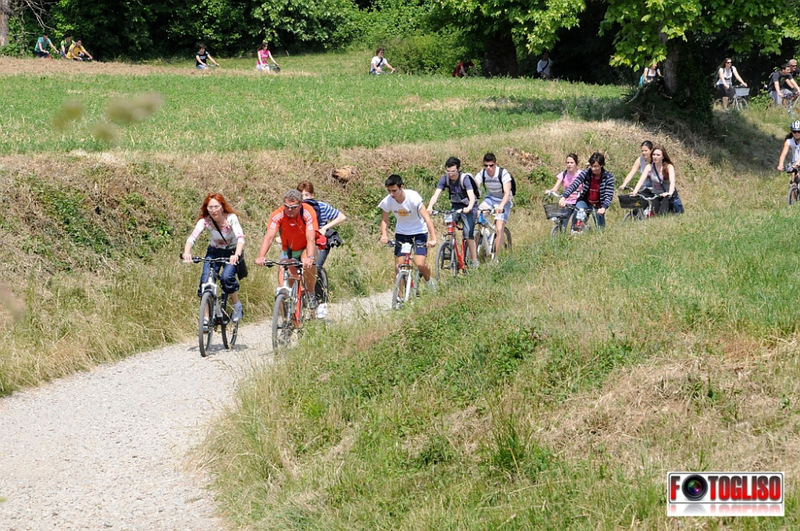 The cycle path continues for several kilometres until the traffic lights in Cazzago San Martino. After the level crossing, take Via Rizzini, still continuing on the cycle path up to the sculpture called "The Wheel". Turn left into Via Per Rovato, passing over the highway. After a short stretch in the industrial area, follow the signs to the centre of Rovato, going straight at the roundabout. 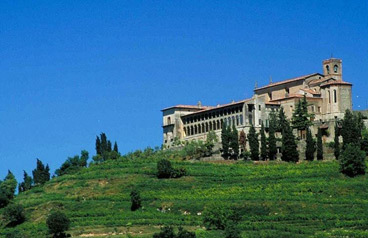 At the traffic lights, turn right into Via San Rocco, where you will find historic houses with elegant stone doorways. Once at the small roundabout, where you can admire Castello Quistini in front of you, turn left on Via Bonomelli and, before crossing the centre of the town, turn right towards the market area in Viale Conte Eugenio Martinengo Cesaresco. 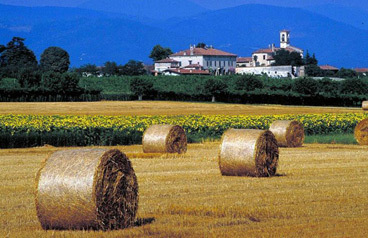 You will be facing Monte Orfano, which will be beside you for the remainder of the route. Go downhill on Via Martinengo and, at the bend, turn right to detour to the convent of the Holy Annunciation after a kilometre of uphill cobbled street. If you do not want to visit the convent, you can make a stop to visit the church of San Stefano at the beginning of the climb instead. Returning the same way, turn right on Via Bettini and continue downhill to Via Gigli. At the end of the street, turn right towards Coccaglio on Via Vittorio Emanuele II, thus arriving at the centre of the town in Piazza Luca Marenzio. On the left you will be able to see the Roman tower and the parish church on the right. After the traffic lights, go right on Via Martiri della Libertà (the small cycle path allows you to enter despite the opposite direction) and continue on Via San Pietro, finding the church of the same name on the right. 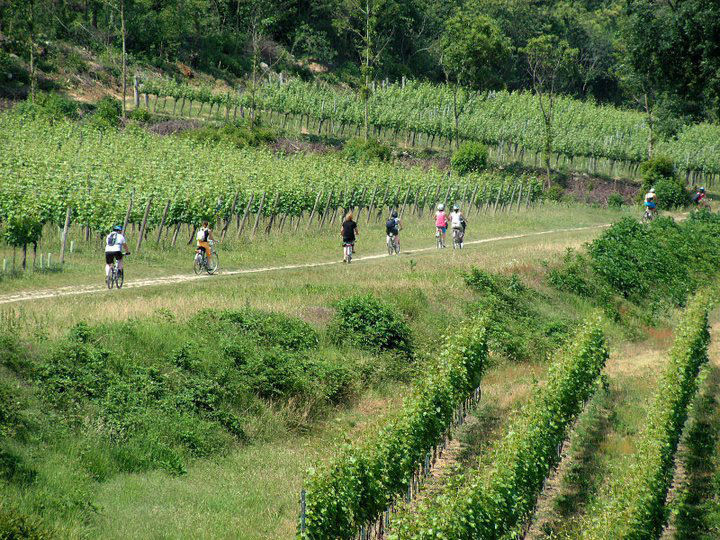 Now you follow a beautiful, wide, long cycle path up to Cologne. At the end, continue straight for a few hundred metres, finding the cycle path again a little further on in Via Vittorio Emanuele and Piazza Garibaldi. Now follow the signs to Adro and Iseo. Turn right into Via Cappuccini until you reach Spina, arriving in Via Marconi. 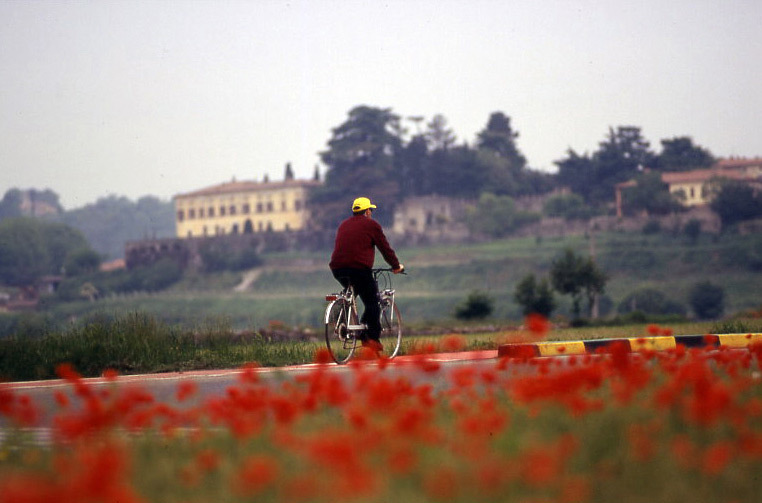 Turn right at the traffic lights, following the signs for Erbusco-Rovato, and right again at the roundabout, into Via Fontanelle, which is flanked by vineyards. Going right on to Via Volta, which is slightly uphill. 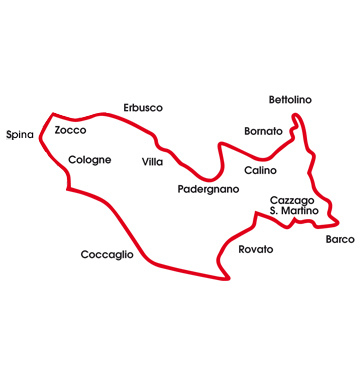 After the underpass you will be in Zocco d'Erbusco, in Via Costa. Continue to cycle to the traffic lights, which will allow you to cross the provincial road. 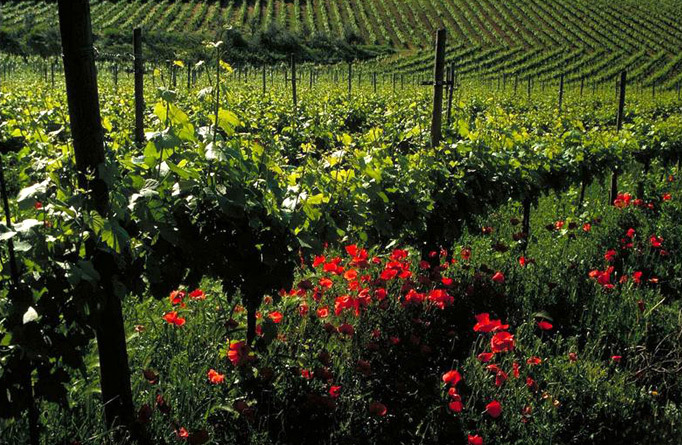 Right in front of you is Via Verdi: follow it and on the right you will see that you are back at the offices of the Strada del Franciacorta, where this pleasant itinerary terminates.